Got 15 minutes? Then you have enough time to make this totally yummy flatbread! 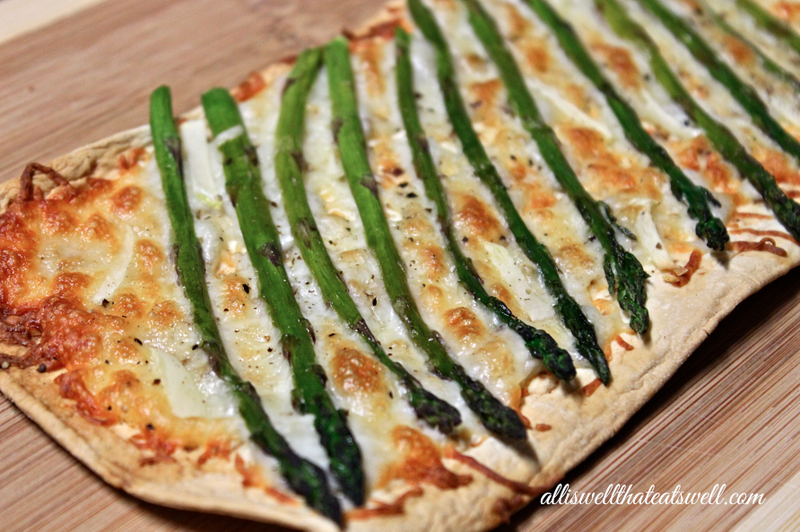 Asparagus ROCKS...not only is it super tasty, but it's also a low calorie food that serves as a great source of Vitamins K, B-complex, C and A. I LOVE how beautiful the individual asparagus spears look when they are lined up on this simple garlicky, cheesy flatbread. Great for parties or to munch on all by your lonesome. Enjoy this delicious, nutritious asparagus flatbread! 1. Pre-heat oven to 400 degrees. Once ready, place asparagus and flatbread into oven separately for about 4 minutes and remove. This is to both heat the bread and allow the spears to cook a bit before making the flatbread dish. 2. Take the flatbread and add cheese, fresh garlic (or granulated garlic) and line asparagus spears on top as pictured above. Drizzle with extra virgin olive oil, add salt and pepper to taste and place back in oven for about 8-10 minutes. PS- Extra delicious with a glass of white!